Launched earlier this year, the all new 2019 Chevy/GMC 1/2-ton trucks bring even more refinement GM lineup. Along with the redesigned body and interior the chassis and suspension has been updated from previous model year trucks. 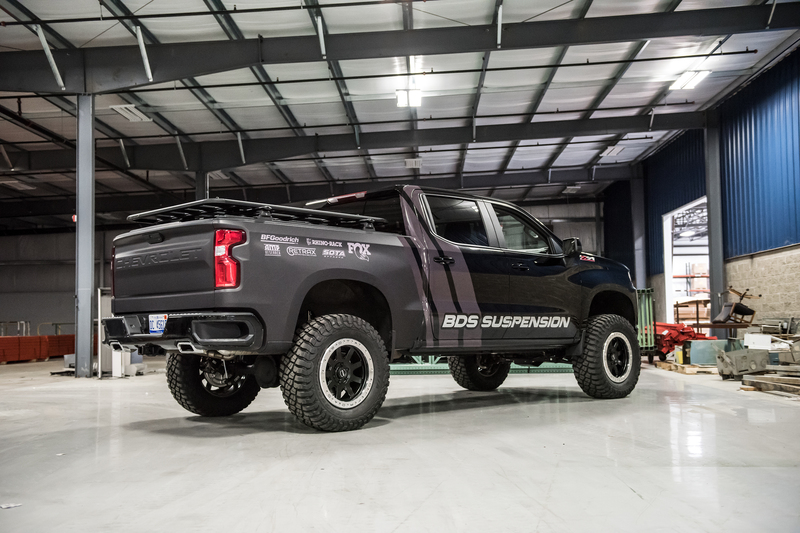 After months of design, testing and American manufacturing BDS Suspension is excited to announce the release of new 6” IFS Lift Systems for the 2019 Chevy/GMC 1500 trucks. These new systems to the highest quality standards for on-road comfort and handling while improving offroad capability with clearance for 35-37” tires. As with all BDS lift kits, these new kits are backed by Factory Protection Plus for piece of mind wherever your adventures may take you. Factory Protection Plus includes BDS’s exclusive No Fine Print Warranty, FMVSS No.126 ESC system compatibility and a 5-year 100,000-mile drivetrain warranty. Coldwater, MI - With an all new truck comes an all new suspension. 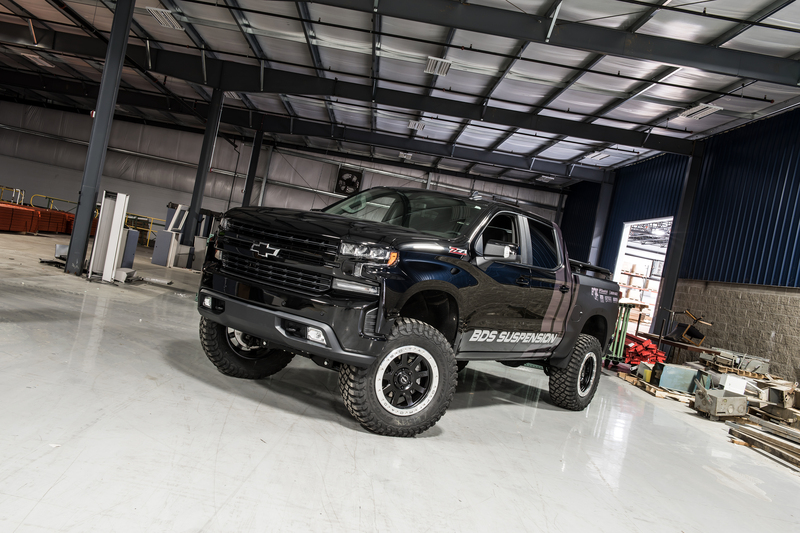 Now available for the 2019 model year Chevy Silverado and GMC Sierra 1500 trucks BDS Suspension has released complete 6" IFS lift systems. 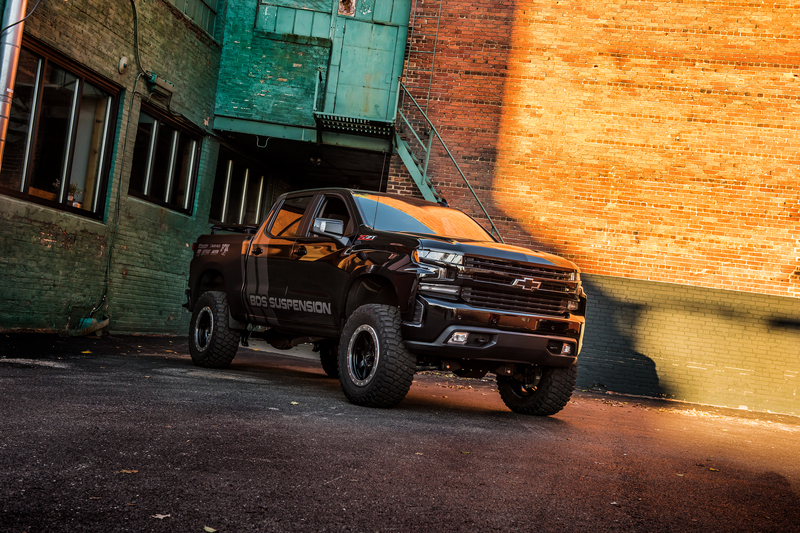 Based around the tried and true high clearance technology that has made BDS the go to for GM suspension lifts, these systems have been designed from the ground up to get the more out of your truck with the most ground clearance on the market. This new 6" lift system is the first of many new BDS options to come available for the new trucks bringing you on road comfort, off-road capability and clearance for 35-37" tires. While some companies build "kits" to fit larger tires, BDS Suspension prides itself in engineering complete suspension systems designed to take your vehicle's performance to the next level while retaining OE-level functionality. Case in point the (NHTSA) National Highway Traffic Safety Administration's FMVSS No.126 compliance standards requiring any aftermarket modification to not adversely effect the vehicle's electronic stability control (ESC) system performance in the event of an evasive maneuver. These new kits have been independently tested and certified compliant with these standards with up to 37" tires [as tested on 37x12.50 Mickey Thompson ATZ P3 tires on 20x9 Black Rhino wheels w/ 5.5" BS]. At the heart of this new 6" system BDS utilizes a pair of 1/4" thick laser cut high clearance crossmembers to maximize clearance and provide a solid mounting point for the OE lower control arms. These paired with the 3-piece heavy duty front skid plate system create a rigid subframe while adding protection for vital steering and driveline components. In place of the factory steering knuckles a pair of specially designed ductile iron replacement steering knuckles are supplied to maintain proper steering geometry for ESC system compatibility. These connect to the factory steering with a pair of heavy duty replacement tie rod ends included in the kit. The front differential is repositioned with BDS's multipoint relocation bracket system tying into the frame and control arm pockets to further secure the front differential to keep CV axle angles at a minimum. A billet aluminum front driveshaft spacer is also supplied along with longer hardware to allow the reinstallation of the factory driveshaft. Additional ride height on this particular kit comes from a set of top mounted steel fabricated strut spacers to mount onto the factory strut assemblies. These allow for quick-simple installation without the need to disassemble the factory struts and retain the OE ride quality. A pair of BDS-branded sway bar drop brackets used to correct the operating angle of the factory sway bar as well as created a strong brace between the rear crossmember and the frame. Rounding out the front of this kit are new lower control arm cam bolts to allow alignment and a weld-in frame reinforcement plate for extra strength. In the rear of this 6" lift system, the factory block is replaced with a 5" lift block and longer u-bolts to lift and level the stance. Also included, BDS supplies brake line and ABS line brackets allow the use of factory brake lines. Your choice of specially tuned NX2 nitro series gas shocks or FOX 2.0 IFP performance gas shocks are supplied to round out the rear of these kits. All kits come finished in a durable textured black powdercoat and sent with all hardware packs to complete the install along with step-by-step installation instructions. All BDS kits include Factory Protection Plus for the ultimate extended warranty to include BDS's No Fine Print Warranty, FMVSS No.126 (ESC System) compliance certification and a 5year-100mile drivetrain warranty to match the dealer. 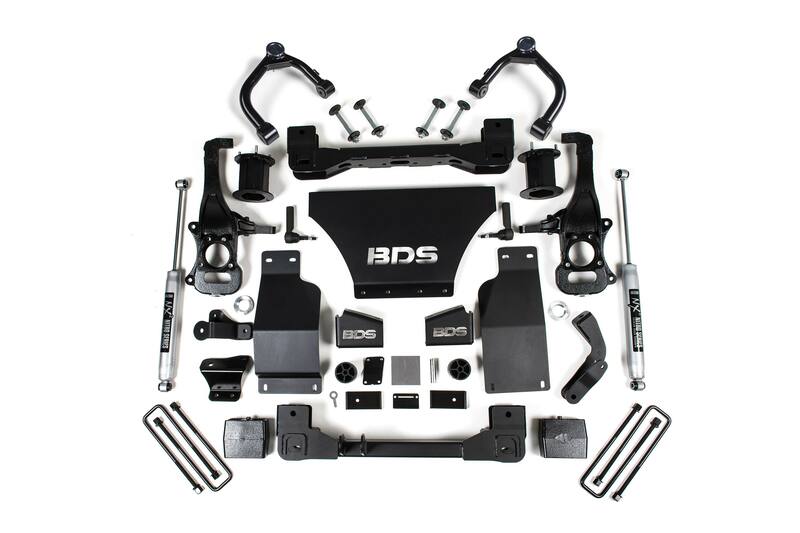 Improve the look and capability of your 2019 Chevy/GMC 1500 truck with this new 6" lift system from BDS Suspension. Any lift kits yet for this truck? Hi Jerry, At this time we haven’t released any kits specific to the Trail Boss and AT4 models. Keep an eye out for future releases though, once kits are available we’ll be sending out an announcement and begin promoting on our website and social media outlets. Do we have an estimated release date on a lift kit for the AT4 model yet? Do these kits fit the 2019 GMC Sierra Denali 4WD w/ Magnetic Ride Control? At this time we haven’t released the MagneRide-compatible kits for the 2019 models, but they are in the works. Keep an eye out for upcoming announcements when kits hit the shelf ready for sale. Any news on when there will be a 4 inch available for the 2019? I can go as far to say the 4″ kits are in the works for the 2019 Chevy/GMC 1500, however they haven’t been released quite yet (and per company policy I can’t discuss when they are expected to be released). Once kits are on the shelf ready for to ship we’ll be sending out an announcement and start promoting. Will this kit fit 22’s on 35s? we list our recommended wheel tire specs to include 35s/22s in the spec chart on the listing. That said you’ll want to follow our wheel width/backspacing recommendations to maximize clearance. While other wheel specs can be used, they may require additional trimming/modification for clearance. Do you offer an actual suspension lift with out those fake “lift” blocks? Not sure what you mean by “fake” lift blocks, using rear lift blocks is a fairly common practice both by OEMs and aftermarket with GM and Ford doing it from the factory on their trucks. That said, to your point no we haven’t released the full rear spring options for the 2019 GM1500 trucks at this time, but will be offering the option in the future as well as FOX 2.5 coilover conversions for the front. Hi Thomas, unfortunately per company policy we don’t discuss expected release dates on new products as there are a number of factors (some out of our control) that play into the development/testing/manufacturing timeline. As new products hit the shelves ready to ship we’ll be sending out announcements and begin promoting on our website, blog and media outlets. will this 6″ BDS kit fit my 2WD 2019 Chevy Silverado 1500 LTZ crew cab w/o MagneRide? The 4WD kit can be used on 2WD models, however you’ll have a few parts not used (differential drop brackets, front driveshaft spacer). We’ll be offering a 2WD version of the kit at some point in the future, however currently the plans are to finish out the 4WD kit sizes/options first. We have not released the FOX coilover options at this point, but similar to our other application listings they will be offered in the future, lead time is typically a bit longer on the coilovers from the rest of the kit. As far as the track width change, the front is increased by roughly 1/2″ per side. While its not a requirement to install rear spacers and not as noticeable as with older GM trucks, if the 1/2″ is bugging you rear wheel spacers can be added. Thank you Carter for letting me know about the rear spacers. Yes on older GM trucks the track width would increase. If its only 1/2″ per side that wont be even noticeable. Running 1/2″ spacers to even it out wouldn’t make sense and most likely would need to cut the OEM studs to make them work. Since you answered my question on coilovers my only option is to go with BASIC kit for now and upgrade later. With that said I plan on running 22×12’s with -51 offset with 325/50/22 tires. Do you think major cutting/trimming will be needed? Thus the reason I inquired about the coilover option. That isn’t a wheel/tire combination that we have tested, but my assumption would be that some trimming would be needed to clear in all driving situations (i.e. wheel turned tight pulling up into raised driveway or used offroad where the suspension may be articulated with the wheels turned). Likely the lower corners of the inner fender would need to be trimmed. The coilovers won’t give any additional clearance being they’ll be preset for 6″ of lift, the benefit would be improved ride and offroad performance. While we haven’t tested that particular setup they’d likely have clearance to bolt-in place with our kit. The main concerns would be ride height adjustability and overall travel being those Icons are listed for 1.5-3.5″ of lift. The strut spacer used in our 6″ kit is designed to bolt onto the factory strut to net 6″ of lift. I don’t know if the Icon’s could be adjusted up to 6″ to eliminate the need for a strut spacer or adjusted down to 0″ lift to use in combination with our spacer. We don’t recommend setting ride height taller than 6″, being the rest of the suspension/steering/driveline components are designed for 4-6″ of lift. My recommendation would be to go with the standard kit for now and upgrade to the bolt-in FOX coilovers once they are released to ensure compatibily. Will BDS be releasing a 8” lift kit in 2019 for the new body style 2019 1500’s? Possibly at some point in the future, we have a number of kits in the works for the 2019 GM1500 platform. That said per company policy I can’t get into new product development topics to discuss products, pricing, expected release dates. As parts hit the shelf ready to ship we’ll be sending out announcements and begin promoting. I just ordered this lift for my 2019 RST Silverado and plan to use my factory 20″ wheels. I’m not sure the backspacing but can I run a 35×12.50 on that OEM wheel or would it be better to runt he 295/65? Stock 20″ wheels can be reinstalled with up to a 35×12.50 tire.